To fix mixed content problems if we already have so much many of posts in our blog it's really troublesome, because we have to look for any posts that contain mixed content problems and fix them one by one. 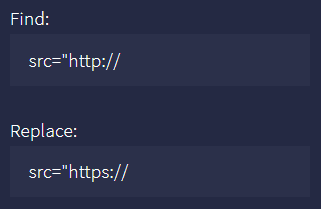 Mixed content generally occurs when we insert an address with an http prefix like in an IFRAME, IMG or Script tag or also in the CSS link tag while our blog is served in https. As a consequence, our blog cannot display parts that have the http prefix. Now mostly Text editors have Search and Replace features. Of course, it will be easier if blogspot has features like that, so we don't need to look at a lot of posts that we have. Even so, we can use alternative tools apps to do Find and Replace for every post automatically with the help of adamwlewis's website. Our image source sample is using double quote mark beside single quote mark. The following is an example of how to fix mixed content on an image that is blocked due to serve an http address inside the IMG tag. Note: before continuing, this tool app can do Find and Replace but cannot restore as before if there is an miss typing the replaceable string. So use the tool apps of Adam Lewis carefully and thoroughly. Now click "Transfer me to Google so I can authorize this tool". Once visited, it will ask to authorize it to make changes to our blogger account through google access, click on Allow button. 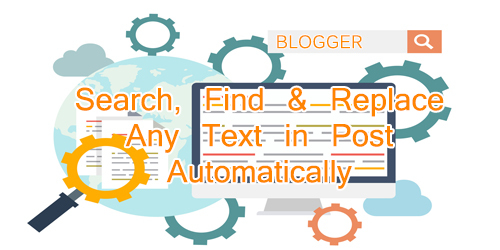 After we authorized it, then we can choose the blog name from a dropdown list to use find and replace in selected blogger blog. Type src="http:// inside FIND input area. Type src="https:// inside REPLACE input area. Click on Perform The Find & Replace button. Check the log textarea and wait till "Search Completed" text shown. In step 7. we ticked TEST MODE, this mean its only perform Search, its the safe way to do the task. Inside the Log textarea we can see which post is contain string text src="http:// inside. We might want to double check that post to see and test an image address url can run with https by open with typing manually in other browser tab address bar. If everything goes well, we can un-tick TEST MODE option and perform Find & Replace again. By TEST MODE being un-ticked this will perform replace any string text contain on FIND input area and will be replaced by string text inside REPLACE input area. It might take some time depending on the size and number of posts in our blog to complete task, wait until text "Search Completed" appear in Log textarea. Once finished, check our post which being replaced by visiting them.